Know the medicinal properties of fenugreek. Some wonderful home remedies to treat many health problems naturally with use of fenugreek. It is wonderful remedies to help diabetic patients. Learn how to use this. Fenugreek (Methi) is a very well-known food item. It is native of South Eastern Europe and West Asia. In India it is cultivated in Rajasthan, Madhya Pradesh, Gujarat, Uttar Pradesh, Maharashtra, Punjab and Karnataka. Its leaves are eaten as vegetable. The green leaves are rich in fibre and relieves constipation. A poultice prepared from leaves is also applied externally on burns and inflammation. The seeds are used in the kitchen as condiment. Fenugreek is known as Methi (Hindi), Venthayam (Siddha) and Hulba (Unani). There are several health benefits of fenugreek. The fresh leaves are good for the digestive system and useful in treating indigestion and the liver problems. The leaves in the form of paste are applied on scalp for promoting hair growth and curing dandruff. Botanical name of fenugreek plant is Trigonella foenum-graecum Linn. and belongs to Fabaceae/Papilionaceae family. There are two species of the genus Trigonella viz. Trigonella foenum graecum (common methi) and Trigonella corniculata (Kasuri methi). Fenugreek plant is an annual herb, 30-60 cm in height. The leaves are light green, pinnately trifoliate. Flowers are white or yellowish white and axillary. Fruits are legumes, 5-7.5cm long, narrow, curved, tapering with a slender point and containing 10-20 deeply furrowed seeds per pod. Fenugreek seeds are bitter, mucilaginous, aromatic, carminative, tonic, diuretic, thermogenic (warming), galactagogue (stimulates breast milk), astringent (constricts tissues), emollient, anti-rheumatic, CNS depressant and anti-implantation. When dry seeds are soaked in water they become mucilaginous. The seeds contains several Alkaloid, Saponins and Mucilage. Alkaloids: Trimethylamine, Neurin, Trigonelline, Choline, Gentianine, Carpaine and Betain. Amino acids: Isoleucine, 4-Hydroxyisoleucine, Histidine, Leucine, lysine, L-tryptophan, Argenine. Saponins: Graecunins, fenugrin B, fenugreekine, trigofoenosides A-G.
Steroidal sapinogens: Yamogenin, diosgenin, smilagenin, sarsasapogenin, tigogenin, neotigogenin, gitogenin, neogitogenin, yuccagenin, saponaretin. Flavonoids: Quercetin, rutin, vetixin isovetixin. Other: Coumarin, lipids, vitamins, minerals;Mucilage 28%;proteins 22%;fixed oil 5%. As per Ayurveda, fenugreek seeds have following properties. Action on body: Fenugreek seeds are dipana. Deepan means digestive stimulant that improves digestive fire and helps in better digestion. Seeds are useful in reducing vitiated Kapha dosha and Vata dosha. Kapha can be understood as mucous with qualities such as heavy, cold, moist, static, smooth and soft. Antidiabetic and hypoglycaemic effect: Fenugreek seeds have blood sugar lowering effect. This may be due to the presence of various phytochemicals (galactomannan-rich soluble fiber, amino acid 4-hydroxyisoleucine) in seeds. The amino acid present in seeds causes direct pancreatic ?-cell stimulation. A study of alloxan-induced diabetic mice has shown that the hypoglycaemic activity of dialysed fenugreek seed extract was comparable to that of insulin. Demulcent: The aqueous extract of fenugreek seeds has demulcent (relieving inflammation or irritation) properties. In an experiment done on rats, it promoted healing of gastric ulcers. It also exhibited a smooth muscle relaxing effect in rabbits without affecting either the heart or blood pressure. Blood cholesterol lowering: The oral intake of fenugreek seeds reduces cholesterol level. This may be due to interaction of saponins and bile acids, resulting in formation of large micelles which are not absorbed in digestive tract, this further results in increased faecal bile acid and cholesterol excretion. Blood lipids lowering: The fibrous fraction of seeds causes a reduction in blood lipids. Seeds also possess Anticancer, Anti-Inflammatory, Antiseptic, Aphrodisiac, Astringent, Emollient, Expectorant, Anthelmintic, Wound healing, Gastro protective and Antioxidant properties. World Health Organisation WHO recommends use of fenugreek seeds in adjuvant therapy for diabetes mellitus, anorexia, also in hypercholesterolemia (excess of cholesterol in the bloodstream). 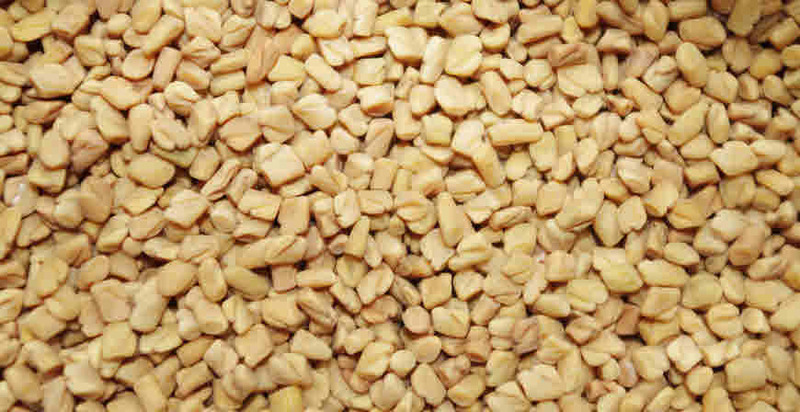 Fenugreek seeds are used in diabetes, high cholesterol, loss of appetite, flatulence, dyspepsia, colic, diarrhea, dysentery, enlargement of the liver and spleen. The seeds have galactagogue effect and used for increasing breast milk. These are also given puerperal tonic. Diabetes: Diabetes is a metabolic disorder that causes rise in blood sugar level and lipid level (hyperlipidemia). Fenugreek has both hypoglycemic and hypolipidemic effects. Scientific study has observed significant decrease in serum triglyceride and cholesterol in hyperlipidaemic patients when treated with fenugreek seed powder. Fenugreek is very effective in controlling diabetes as it seeds works in diabetes by stimulating synthesis or secretion of insulin from pancreatic cells. Hypocholesterolaemic (Cholesterol reducing effect) activity of fenugreek seeds may be due to its insulin mimetic activity. For reducing cholesterol: For reducing serum cholesterol level, take methi seeds and soak in water at night. Eat these soaked seeds two times a day. Controlling high blood pressure: For high blood pressure management take fenugreek seeds and Anethum sowa (dill seeds) in equal amount. Grind them and make a fine powder. Take this powder in a dose of two teaspoonful twice a day with fresh water. Allergic rhinitis: Fenugreek seeds are dry in nature and hot in potency. These are helpful in reducing mucous. In cold, cough, hay fever and other similar conditions, soak fenugreek seeds in water for a few hours. Then boil in water and drink hot, two times a day. Diarrhoea, loose motion, dysentery: For diarrhea treatment, fry dried seeds and make powder. Take 1 teaspoonful of this powder with honey, 2-3 times a day. Asthma: For asthma, first boil the seeds. Then grind them to make paste. Add honey and take twice a day. Take for one month. Arthritis, joint pain, keeping joints fit: The seeds have anti-rheumatic properties. Methi seed powder when taken in a dose of 6 grams twice a day, with water, gives relief in joint pain. Hair growth, preventing hair fall, dandruff: Prepare paste of methi leaves and apply on scalp. Fenugreek or methi can be consumed in many ways. The leaves can be cooked as vegetable. Paratha can be made by kneading methi leaves in atta. The seeds can be powdered and taken in a dose of 6 grams. The seeds can be sprouted and chewed as salad. Fenugreek tea can be prepared with seeds. Tea prepared from fenugreek seeds are good for stomach related problems and respiratory tract infections. In early stage of respiratory infections (bronchitis, flu, sinusitis, catarrh, pneumonia), fenugreek tea causes sweating, helps body to fight better against infection and shortens duration of illness. You can also make paratha from fenugreek fresh leaves as children refuse to eat it in the form of vegetable. So try this methi paratha recipe. You and your kids will sure like it. Fenugreek is expectorant, laxative, estrogenic and stomachic. Tea prepared from fenugreek seeds are good for stomach related problems and respiratory tract infections. In early stage of respiratory infections (bronchitis, flu, sinusitis, catarrh, pneumonia), fenugreek tea causes sweating, helps body to fight better against infection and shortens duration of illness. Fenugreek seed tea helps to remove accumulated body toxins and cures bad body smell. Take water (one cup) in pan. Bring it to boil. Remove from stove. Add crushed fenugreek seeds in this boiling water. In a tight lid glass container let it steep for 20 minutes. You may steep even for hours. The longer you soak the stronger is tea. You may add honey and lemon juice as per taste. If you are diabetic then avoid adding honey or sugar. You can drink 4 cup of fenugreek tea in a day. Fenugreek is safe to use and exhibits no side effects when taken in proper therapeutic dosages. But in some individuals, it increase the risk of bleeding. It is contraindicated in pregnancy due to its oxytocic and uterine stimulant actions. Oxytocic means a drug that induces labour by stimulating contractions of the muscles of the uterus. Traditionally, seeds are used for easy dethe livery. Fenugreek should be avoided by individuals with peanut allergies. Since fenugreek seeds contain several pharmacologically active constituents, so eat it in recommended doses and avoid excessive intake. Many studies has been done on fenugreek seed effectiveness on type 2 diabetes and result are positive if taken 20gm(2-4 parts) a day. It takes time to showing effects(after 8 weeks). Here is one study which shows positive results. Most important thing when using fenugreek seeds are how you are using it, it will do nothing if you have not taken properly. 1st effective method is make powder of fenugreek seeds and soak 10 gm in hot water and take it early in morning and in night before going to bed. Total 20 gm in a day. Soak 10 gm seeds in water and chew and swallow it, but this is very difficult so try first method. Do not take whole seeds because no one can digest if it is not powdered. Do not soak or mix with any other thing except water. As there is no serve side effect if not consumed very high dosage. This can cause allergy to some people like stomach bloating, swelling in face and others. So do not take if you are allergic to fenugreek. It is advised that use this with consultation of some ayurvedic doctor and monitor your glucose levels. Fenugreek(Methi) can be really helpful to financially weak population suffering with type 2 diabetes, as fenugreek seeds are very cheap and easily available in market. This is helpful in case when hair fall is due to some infection like fungal infection or dandruff. This will not help in natural baldness. What are the recommended dosages . It depends upon problem, please read “Home remedies of Methi for treatment of diseases” section in this post. In general 6gm powder in morning is recommended.